eclipse staging services has recently added equipment from Clear-Com to its inventory. The rental house purchased the FreeSpeak II and HelixNet Partyline systems through the manufacturer’s local distributor, Nicolas Kyvernitis Electronics Enterprises (NMK). eclipse has purchased two HMS-4X HelixNet digital four channel headset/speaker main stations, thirty HelixNet digital two channel dual listen monaural beltpacks together with four dual channel 4-wire interfaces, two FreeSpeak II base stations and thirty FreeSpeak II digital wireless beltpacks. Both FreeSpeak II and HelixNet were used at the third annual Internet of Things World Forum (IoTWF) that hosted over 2000 attendees in Dubai World Trade Centre. 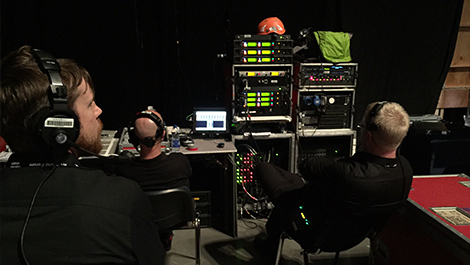 24 wired stations of HelixNet and 16 wireless stations of FreeSpeak II covered intercommunication between the production and technical teams. “The system was very easy to set up and operate. I would say it is rock solid. I will definitely be using it again whenever I get the chance. Clear-Com products are extremely reliable and it sounds amazing for a wireless communication system. Best I've ever used,” commented Wissam Shaheen, Senior Audio Engineer at eclipse. “For any rental company it is very important to have a sturdy Intercom System which can also provide good quality of sound. Helixnet and FreeSpeakII make a perfect combination to meet the requirements of all the big rental companies. Both of these system working on digital technology provide shatterproof and marvelous quality. The design of both systems are very durable and are working flawlessly in all environments,” commented Abdul Hadi, Clear-Com Product Manager from NMK. eclipse Staging Services is a leading, multi-disciplined supplier of technical production services to the live events industry. Based in Dubai and active throughout the entire GCC, eclipse Staging Services supports live events such as conferences, product launches, major concerts, exhibitions, special events, awards ceremonies and large public festivals.